Varinder Walia focuses on an effort to help rural students take the qualifying exams for engineering and medical streams. With a noble mission to offer as good an education in the countryside as available in cities, some Delhi-based Punjabis have launched an ambitious project, Gyan Sewa, in at least 100 villages of Punjab. As part of the pilot project for the first year, two coaching centres have already been set up in villages—one at Talewal village near Barnala in the Sangrur district and the other at Khadur Sahib village in the Tarn Taran district. Every weekend, subject experts from Delhi teach here students of classes XI and XII and train local teachers. Mr H. S. Phulka, a senior advocate of the Supreme Court, says it is their endeavour to enable students of rural areas to qualify for medical and engineering seats. Patwant Singh, an eminent journalist, is the founder of the Gyan Sewa Trust, while its trustees include Mr H. S. Phulka, Dr G. S. Grewal, Dr Raghbir Singh Basi and Mr Avtar Singh Dhindsa. According to Dr Maninder Kaur Phoolka, the gap in the quality of education available in the cities and in villages has been widening. As a result, the education level in villages has been going down drastically. To check this disparity, the Gyan Sewa Trust was formed to set up projects and take quality education (accessible, so far, to students in metros like Delhi only) to the remotest villages of Punjab. The Trust decided to pick the best possible resources available in Delhi and take these to the villages. To bring students from villages to cities for education would probably have cost less than what it would take to transport the faculty from Delhi to the villages. However, notwithstanding the cost factor, the Trust decided to reach the subject experts from Delhi to villages to spread awareness among villagers and to train their teachers. One of the first projects this year is of setting up coaching centres in villages to prepare the students for various entrance examinations. Mr H. S. Phulka says, in big cities, there has been mushrooming of centres that train students exclusively for these examinations. However, students from villages do not have this privilege, even though they may be more intelligent than city-bred youngsters. They just lack the opportunity to study professionally for professional courses. Instead, they choose ordinary streams like BA and B.Sc. There are hardly any jobs after plain graduation or postgraduation. This generates a lot of frustration among the rural youth. In the next five years, the trust proposes to set up 100 coaching centres in villages. It also plans to launch campaigns against female foeticide, drug addiction and cruelty towards women. International Sikh Confederation has been established with the sole motive of bringing together all those organizations, which are working for the cause of Sikh Community so that a Synergy can be brought about in their working and Sikh Community can progress. Keeping this in mind the Ludhiana chapter of ISC has established different committees to coordinate such activities. Dr. Arvinder Singh has been appointed Chairman of Education and Vocational Training Committee and has been directed to constitute his committee by 31st Jan. There will be short-term plans of 2 years duration each and a long-term plan of vision 2020 for this committee. 1. To contact & enlist all the organizations in Ludhiana district which are working in the field of education and vocational training. 2. To collect data from District Admn. regarding literacy levels in Ludhiana District, the availability of primary, secondary & technical education. 3. To start non formal education centers in Ludhiana city and villages where there is need. Different Organisations may be approached to sponsor these centers. 4. To enlist the services of voluntary teachers for this literacy drive. 5. To start vocational training course in villages & Ludhiana city as per need of the area and marketability. 6. To evaluate the services being already provided in this sector by Govt & NGOs and to devise methods to improve the quality. 7. To enlist the support of Deptt of Extension Edu, PAU, JSS Ludhiana, NYK and other such agencies to achieve these targets. 8. To promote the use of Punjabi language in all spheres of life. 9. To provide scholarship to deserving students for higher education. 1. To start 5 centres of excellence in education in different corners of Ludhiana District where primary & secondary education will be provided on a non profit basis, irrespective of caste, creed and economic status. These centres will serve as good foundation for the future of our community. 2. To start 5 centres of technical training in Ludhiana District where students can choose the trade they want to specialise in. 3. To start 5 career guidance centres where coaching for various competitive exams can also be provided. Last month, while traveling to Pune with my daughter, I strained my leg muscle in the coach and by the time our train arrived, I was not in position to move even a yard. The retiring rooms at the station were full. Just then, a Sikh gentleman who had observed us came up and suggested that we move to the nearby gurdwara in the Camp area. Within a few minutes, he arrived with an autorickshaw and gave the driver directions, and us, his contact number. The gurdwara authorities immediately allotted a room to us and I was taken to the hospital run by their trust. After giving first aid, the doctor guided us for further treatment in the nearby nursing home and within two days’ stay at the gurdwara, I improved considerably and was in position to recommence my journey. I have often read about the Sikh community’s noble acts of service without any consideration of caste, religion or faith, especially when natural calamities hit and leave trails of human devastation. It seemed as if they felt that service to humanity was divinely ordained and the guiding path to reach God. This time I had experienced it myself in everyday life. The serene ambience at the Gurdwara was also very soothing for me. As an Indian living in India, where people practice different faiths I have a chance to know something about all religions. The Sikh community has finally spoken up against the onslaught of Sardar jokes. The immediate provocation is a booklet on Santa Banta SMS jokes, in circulation in Mumbai. The booklet cover has two Sikhs – Santa in a pink turban and Banta in a blue one. “We have no problem with the use of the names Santa and Banta, but here they are clearly portrayed to be Sardars,” said Jasmeet Singh, a member of the Sikh Media and Culture Watch that has complained to the Maharashtra Minorities Commission. In a memorandum it submitted to the minorities’ panel on Wednesday, the Sikh group said such acts were “deeply humiliating” and should be considered racist. This deplorable act has been further compounded by the inaction of the Sikh leaders /Sikh organizations based in India – who have shown little or no interest in this very serious matter. Issuing of letters /statements in the media without follow up action and no end result seem to have become the “convenient” way out. While long-term solution to this problem should be worked out, in the short-term, these Sikh students should be provided with scholarships and opportunities by the Sikh community to pursue their education in other countries so that their formative years are not wasted. It is appealed to the Sikh community to impress upon the GOI /Government officials to deal with this on an urgent basis. It is further appealed that Sikhs worldwide should show solidarity and protest against French interests – wherever they can. Sikhs have voted for known anti-Sikh Political party – Congress. BJP known anti-minority party responsible for Punjab’s trifurcation has voted Akali Dal to power. London, December 28. England may have lost the battle for the Ashes to arch-rivals Australia, but Monty Panesar has a reason to celebrate after the left-arm spinner edged out ailing Cuban leader Fidel Castro, Archbishop of Canterbury and Inzamam-ul Haq, among others, to win the Beard of the Year 2006 Award. The Beard Liberation Front (BLF), an informal network of beard wearers, said in a press note that Panesar has finished on top, narrowly beating Castro. Archbishop of Canterbury Rowan Williams and veteran trade union leader Paul Mackney were tied for the third place after a vote of BLF supporters for the hirsute person who has made the most impact on public life in 2006. Other nominees for this year’s award included author Bill Bryson, broadcaster Bill Frindall, politician George Galloway, journalist Christopher Howse, broadcaster Brian Perkins, author Terry Pratchett, broadcaster Tom Robinson, Stilton cheesemaker Richard Rowlett, actor Ricky Tomlinson, Jimmy Wales of Wikipedia and musician Robert Wyatt. Panesar, first Sikh player to don England jersey, has been a front-runner for the award right from the beginning and BLF organiser Keith Flett told BBC Radio Northampton that it was combination of facial hair and on-field heroics which tilted the scale in the spinner’s favour. “He may have a beard for slightly different reasons, but at the end of the day it’s still a beard, and it’s a magnificent beard,” Mr Flett reasoned. Incidentally, Andrew Flintoff had won the inaugural edition of the award back in 2004 and was declared joint winner, along with Paul Mackney, last year for his gingery-blond designer stubble. Fighting a lost Ashes battle in Australia, Flintoff did not feature in the nominations this year as his “beard has declined during 2006,” according to the BLF statement. Here Gurmukh means a perfect person having the illumination of God within. In view of above it may not be possible to have a perfect version of its interpretation from which it has to be translated into English unless Gurmukhs are associated with the task. This limitation, you yourself have pointed out in your writing that interpretations made by Bhai Sahib Bhai Vir Singh and Bhai Sahib Dr Sahib Singh, the two great and giant Sikh scholars and also both being Gurmukhs, do not match. In view of this, endeavour should be made to produce a version which could be called a base lined version which may be open to be improved subsequently as and when interpretations are made by the highly spiritually elevated souls. However, if a standardized version, without making it perfect, is produced, it will block the way forever for a better and a true version to come in future. I am very grateful to you for publishing my letter on the subject : Translation of Guru Granth Sahib in English, published in AOSS (Vol IX, Issue 1) Jan-March, 2007, pages 126-27. My house address is #600, instead of #200. I shall be obliged if these corrections are published in the next issue of AOSS to maintain the sanctity of words of Gurbani in true spirit. First of all accept my heartiest congratulations on your monumental work of Gur Panth Parkash. Everybody knows it is the primary source of Sikh history. Due to its chaste Punjabi language, only a few scholars could read it. But you have done a wonderful job to translate it into a very simple English to be understood by a layman without changing its rhythm in original. And the sone te suhaga is that now this work is available in three script in one book – Punjabi, Roman and English. Some Punjabi people cannot read Punjabi language, a transliteration is a great help for them to understand. 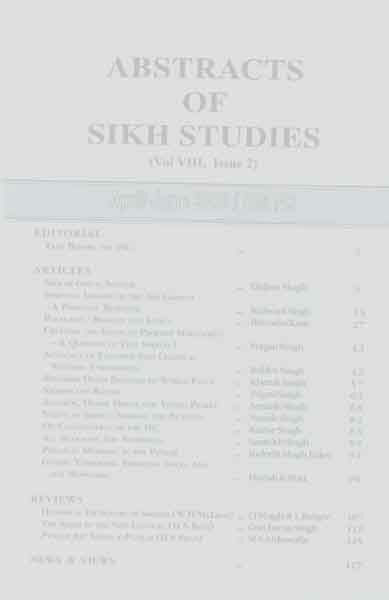 I think it is a new addition to the Institute of Sikh Studies’ achievements. I have discussed with some of my friends here in USA about the contents of the book. They are very much interested to read it. I also congratulate the Institute of Sikh Studies for its new website. The old one was an incomplete website, which disappointed the visitors. It is now updated with new Abstracts. Also, a few other Institute’s publications are also available on the site and are very user friendly. I, therefore, request that the other books published by the Institute may also be posted on the new website. Our impressions about Sant Babas and their deras are mostly based on hearsay or news items in TV or newspapers. I have not come across any serious research paper or publication giving what lifestyle they have, what they teach, and what influence they have on Sikh society. It will be a good idea to interview some devotees to have first hand impression. I can give a gist of what I observed and felt on short visits and infrequent associations with some of them. My first association was with Sant Niranjan Singh ji who used to visit Lucknow in 60s and 70s. He had a saintly appearance, a polite and soothing conversation, mostly did keertan, many a time at amritvela and gave discourses on gurbani and spiritual life. If there were Hindu devotees in the gathering, he used to quote from Gita also. He discouraged people from touching his feet, but many still did this anyway. When I was posted in Patiala, I visited his dera a few times. Gatherings were smaller, mostly he did keertan and very brief discources. His stress on simran and holy life did influence the devotees. Once I happened to visit with a friend dera of Baba Virsa Singh in his sprawling farmhouse outside Delhi. Baba ji was inspecting horses in his stable, so we could not have audience with him, though we did have a glimpse from a bit far away. We sat in the congregation. A discourse on some incident of Babbar Khalsa movement was being narrated fiercely by an equally fierce looking person. I believe many devotees, high positioned officials, are associated with the dera. Their views encouraging Dasam Granth are well-known. During my first visit to USA, a relation took me to dera of Singh Sahib Yogi Harbhajan Singh ji. By chance Brig Hardit Singh had also come, so we were together. He received us courteously. We offered some books by IOSS, which he glanced at casually and passed on to his staff. His wife, Bibi ji, though showed some interest. Yogi ji talked mostly of his association with Presidents, PMs, Church heads, etc., and very little of bani or Sikhi. At dinner time, he passed some harsh comments on Bh Vir Singh ji, which made us sad. He gave us siropa in the diwan next morning and asked us to see sports followed by langar. Many devotees touched his feet. He was very popular and respected by Gora Sikhs. His followers get up at amritvela, do nitnem and yoga and maintain - disciplined life as Sikhs. His views propagating Kundalini yoga are not in line with Sikh thought, nor is his installing miniature statues of the Gurus around the building. Notwithstanding this, his popularizing Sikh faith in West is commendable. Another place I visited is worth mentioning. Dodra near Mansa. The head, popularly known as Bauji, was not there for health reasons. The sangat is well known even abroad for stress on Nam simran. Then an annual samagam was being held. Arrangements were modest but adequate. Special features were self help for cleaning toilets. Naam simran at amritvela, then nitnem and keertan. Food, simple dal-roti. Free time was used for informal discussions on simran, spiritual state of devotees and other Sikh topics – no politics, no mundane matters, no backbiting. All by voluntary attitude. Atmosphere of love and devotion overwhelming. People gathered around enlightened individuals to ask questions and listen. No upmanship. I attended some other gatherings in Patiala and now in Mohali. Similar atmosphere prevails. I have listened to audio tapes and read pamphlets on Bauji’s discourses/views; these are highly emotional and sentimental in the love for the Guru, Waheguru, and sangat and one cannot remain untouched. In this holy environ, I got the feeling of all pervading love! Bh Jasbir Singh Khanewale was known for devotional keertan on a simple tune and for his great philanthropic work of setting up and running the Eye Hospital at Sohana. He was ever busy on constant tours to sangat far and wide for collecting funds for the noble cause. Once I had audience with him for a personal problem which was worrying me. His few soothing words interspersed with Gurbani made me feel at peace – as if the Guru had spoken through him. Soon after retirement, I came in touch with Baba Iqbal Singh ji of Baru Sahib, and for a year took Sikh History classes for 10+1 class at Chandigarh. His zeal for education for rural boys and girls is to be seen to be believed. It combines general education with Sikh tradition - early rising, nitnem, keertan, awareness of Sikh History, etc. Although he is a retired Director of Agriculture, with his rustic appearance, and soft words everybody feels comfortable with him; he has attracted best talent and devoted team to run his institutions, which are ever expanding. Recently, he has published a book on Sikh principles Sikh Sidhant which on a systematic format gives a gist of Sikh thought. He insists devotees to greet him with Gur Fateh though some still touch his feet.